Apparently I’m a bit of a slow learner. I turned a 31-day Bible study on prayer into a 2 months-and-1-week marathon. We’ll just say that I took my time going through these verses! On Friday, I wrapped up that Bible study on prayer. I’d been using this list of verses, writing each day’s verse in my notebook. If I had any thoughts on the verse, I put that down as well. I then read several commentaries on the verse, and wrote down any ideas that I found interesting. 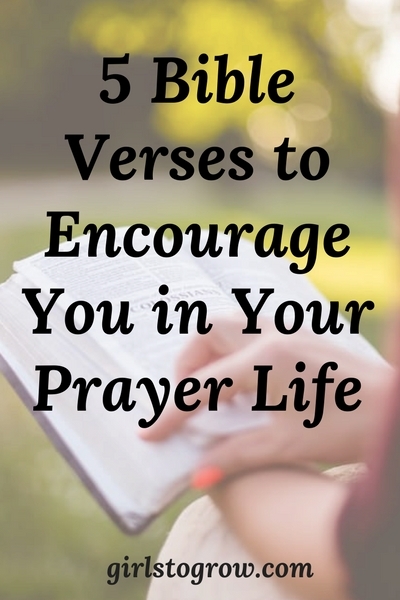 To celebrate the end of that study, I wanted to share five of my favorite Bible verses on prayer and tell how each one encourages me. This is my all-time favorite passage about prayer! It tells me that God trades my prayer for His peace. MacLaren says, “If a man does not pray about everything, he will be worried about most things.” Another of my favorite truths is woven into this verse. As Christians, we should live in a constant state of thanksgiving. Gratitude can frame our lives in a way that is pleasing to God and a testimony to others. That right there is a whole ‘nother post! The word “helpeth” means “assists another in carrying a burden.” The Holy Spirit knows we are weak, so He comes alongside us to help carry our burden. What a blessing that is! I often realize that I don’t know exactly how I should pray about a situation. I’m unsure about what to ask for, and recognize that I need wisdom to guide my request. The Holy Spirit, however, knows what I should be asking for. He pleads and advocates with the Father for me. I can approach God confidently and tell Him all that is in my heart and on my mind. It’s interesting that we’re told to come boldly before God to ask for two specific things – mercy and grace. Anytime I need inward, spiritual blessings, I know I can ask for them without doubt or fear. Don’t you think that God is sometimes just waiting for us to come and ask Him for mercy in our trial or grace in our sorrow? He wants to give as we ask! Charles Spurgeon said, “Prayer moves the hand of Him who moves the world.” Productive, passionate, sincere prayer is wrought by the energy of the Holy Spirit, and is very powerful with God for getting what we desire. I notice that this statement about availing prayer is related here to our praying for others. In the following verses, it’s related to Elijah and his prayer about rain. We can touch God’s heart when we pour ourselves out in prayer for others and in asking for His will to be done. The emphasis of this passage is faith. This ties in to James 1, where we’re told to “ask in faith, nothing wavering.” Faith is a fruit of the Holy Spirit. We need His help to secure the faith we need as we pray. Will we always get the answer we seek? No. Ellicott says, “Every true prayer involves the submission of what it asks to the divine judgment.” As we pray, we can trust that God will answer every request that is for our good and for His glory. I’m excited about starting a new Bible study this week! I’m deciding between a couple of different topics, so I’ll be sure to let you know which one I choose in Friday’s newsletter. What’s your favorite verse about prayer? I think it just means that you took your time, learning as much as you could from each verse before moving on. 🙂 If it makes you feel better, it always takes me longer than a year to read through the Bible in “a year.” Usually, more like two! I love your thoughts on these verses, and thank you for sharing them! There’s a lot of truth and treasure here, and I can use the reminders of how to pray, what to pray, and things like that. As I read about each verse, I thought that one was the best — until I got to the next one. 🙂 Great post! Thanks, Nikki, for your kinds words about the post, and for encouraging me in my slow progress through that study! 🙂 I did sometimes spend more than one day on a verse, though, especially if the commentaries had a lot to say about it. As you say, I wanted to learn all I could from that verse in the moment – though I know if I study it again a year from now, I may see something new-to-me that I missed! Philippians 4:6-7 is my fave, too!! !